Densha de Go! Shinkansen EX (電車でGO！新幹線EX 山陽新幹線編, Densha de Go! 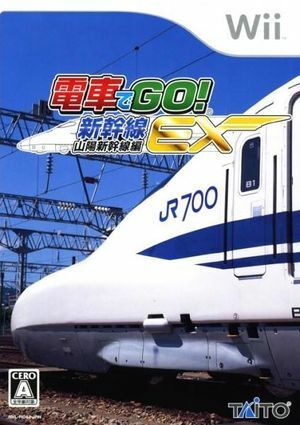 Shinkansen EX Sanyō Shinkansen-hen), translating to Let's Go By Train Shinkansen EX in English, is a Japanese train simulation game created and published by Taito for the Wii console. The game is only available in Japan. Densha de Go! Shinkansen EX contains actual train (or tram) routes based on real services in Japan, recreated in Wii graphics. For the most part, the user's task is to drive the train and adhere to a very exacting timetable, including stopping at stations to within as little as 30 cm of a prescribed stopping point, ideally within half a second of the scheduled arrival time. Along the way, the user is expected to obey speed limits and other posted signs, sound a warning for work parties along the track, arrive at between-station waypoints on time, and perform similar tasks. Taito released a specialty controller, the "Shinkansen Controller", to better simulate train controls. It has yet to be tested in Dolphin. The graph below charts the compatibility with Densha de Go! Shinkansen EX since Dolphin's 2.0 release, listing revisions only where a compatibility change occurred. This page was last edited on 10 January 2018, at 17:39.